Loudoun County Human Services Strategic Plan community meeting on February, 8 2019. In addition, members of the public are invited to participate in a series of community meetings to give their feedback on how to improve Loudoun’s human services. 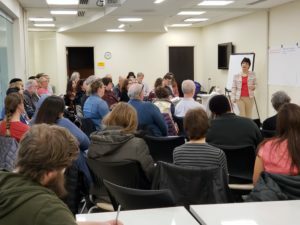 The first series of community meetings was held on February 8, 2019. One hundred community members participated in facilitated discussions addressing human services needs across the County. Another series of community meetings will be held on March 29, 2019. Details for the upcoming series of community meetings will be finalized soon. If you are interested in receiving notifications about the upcoming community meetings, please email nicole@communityfoundationlf.org. The southern end of Loudoun County has grown exponentially over the past two decades and growth continues at a rapid pace. The Human Services Strategic Plan should recognize that the Route 50 corridor is not well served by the County and plan accordingly. Loudoun has population centers that are not along Route 7. It is time to open an office in southern Loudoun County or at least offer mobile service on a regular basis at the Dulles South Recreation and Community Center. I helped to found the Dulles South Food Pantry in 2014, and served as its President from 2014-2018, because I saw that our community’s needs were not being met by existing food pantries. Needs remain unmet in other Human Services areas. Thanks, Charlene! 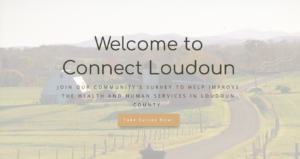 We encourage you to enter your comments into the online survey at https://www.connectloudoun.org so that your feedback is included as we develop the human services strategic plan. Hello Susan, the survey closed on February 22 which is why it is no longer available on the website. However, we are getting ready to host a series of public meetings to get additional input, and we’ll announce the meeting dates and locations on the Connect Loudoun website as well as on this site. We hope you can join us for one of those meetings!